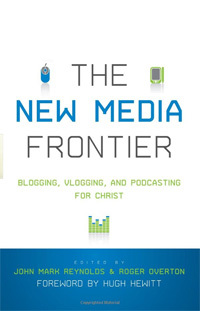 The New Media Frontier: Blogging, Vlogging, and Podcasting for Christ. Edited by John Mark Reynolds and Roger Overton. Wheaton: Crossway Books, 2008. 254 pp. $16.99. The book is divided into two main parts. Part one introduces the concept of new media and explains their basic components. In the first two chapters, Reynolds puts new media in a historical context and indicates where he believes the future of these forms of communication is headed. In chapter three, Matthew Anderson cautions against “uncritically embracing the new media” and discusses important areas where believers need to practice discernment (p. 55). In chapter four, Joe Carter outlines a beginner’s toolbox for blogging, and Terence Armentano and Matthew Eppinette do the same for audio and video podcasting. Part two consists of a series of essays geared toward individuals in a variety of fields. The contributors argue here that new media can helpfully impact areas such as theology (David Wayne), community (Tod Bolsinger), pastoral ministry (Mark Roberts), student ministry (Rhett Smith), evangelism (Roger Overton), academia (Fred Sanders), education (Jason Baker), politics (Scott Ott), bioethics (Joe Carter and Matthew Eppinette), and social concerns (Stephen Shields). Each essay includes a brief introduction to the field and actual examples of what utilizing new media in this area would look like. The philosophical and theological framework that is provided for believers interacting with new media is a primary strength of this volume. The writers are well aware of the paradox of writing about new media by means of “old media” (a book) and address this phenomenon directly. They undertook this project not for the media savvy, but rather for those who have misunderstood the medium or are simply unaware of how it works. Accordingly, the editors set a tone of urgency that is maintained throughout the book (p. 42). They emphasize that the window of opportunity for Christians to make an impact in this area will not last indefinitely. Even so, their analysis is neither alarmist nor naively optimistic. Rather, the contributors urge that believers use and engage new media “wisely” (e.g., p. 125, 136, 159). There is a sustained interest in the “habits of the mind” and the “identity shaping” of individuals using these new technologies. This holistic approach strengthens the project and will prolong its influence. The contributors also provide the vocabulary necessary to articulate a discerning interaction with new media. This feature is especially helpful for those unfamiliar with the newer technologies. Reynolds defines “new media” as “any material presented to a person in digital format that can be cheaply and easily accessed, distributed, stored in a variety of ways, manipulated, and consumed by an average person” (p. 24). In the first part of the book, basic concepts like blog, podcast, vlog, and video sharing are explained, and the hardware, software, and other tools needed both to create and consume these new communication mediums are addressed. 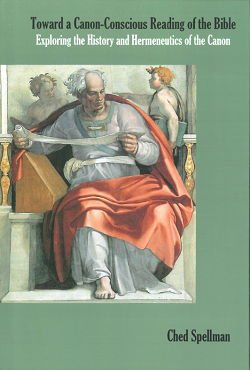 The chapters devoted to these basic mechanical procedures bridge the conceptual framework of part one and the practical applications of part two. One appropriate feature of the book is the engaging nature of the articles. All of the writers are active participants in the new media culture and have made their web addresses available before each essay. The reader is thus encouraged to visit a contributor’s website or blog after reading his chapter. This opportunity extends the scope of interaction with the book and narrows the gap between the old and new media formats. Another key issue relates to the idea of “community.” Any discussion involving new media must address the nature of the community that the online world is capable of producing. Can an online network of individuals provide true Christian “koinonia,” or is the very notion of a virtual fellowship simply a result of the individualistic impulses of the prevailing culture? Though they vary in their responses to this issue, the contributors agree overall that new media function best as a complement to rather than a replacement of genuine Christian fellowship (e.g., pp. 115-16). Still, in this volume, the “community” is often spoken of in “universal” rather than “local” terms. An emphasis on local churches might add a needed dimension to this discussion. Noting these strengths, there are inherent limitations of this project. Any publication treating a “new” phenomenon runs the risk of swiftly becoming obsolete with technological advance. For instance, inevitably some of the links provided in the footnotes and text will at some point no longer work, and the technology discussed in the practical sections will swiftly progress beyond the scope discussed in the essays. However, because the authors speak not only to the specifics of the new media themselves but also to the heart and mind of the user, the overall framework they delineate here will endure long after technological development dates their discussion of particulars. For, as Reynolds asserts, “while technology changes, the essence of men does not” (p. 24). In sum, this volume makes a sustained argument throughout: The new media have revolutionized the way people communicate and are here to stay. Thus, believers must think critically about these changes and utilize the best of them for the glory of God and the furtherance of his kingdom. Through its timely analysis and stable framework, this book will help believers execute this task as they navigate through the “new media frontier” and beyond.